Luxury Manhattan hotels that shout “War Eagle,” billboards, store fronts… New York has been reppin’ Auburn so hard lately. 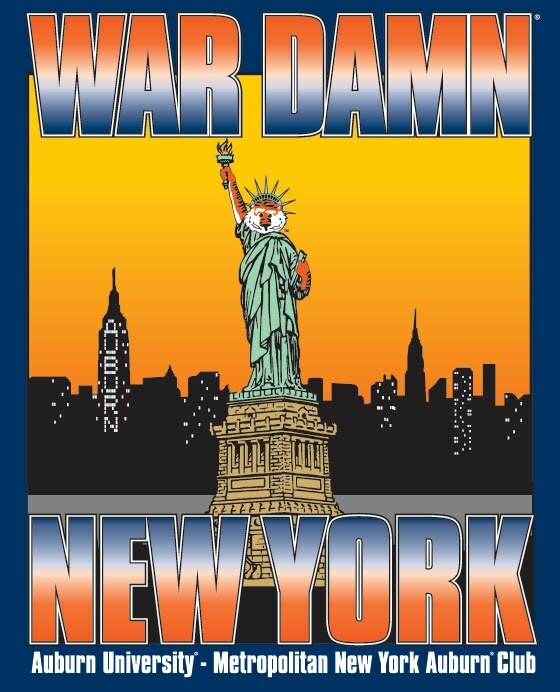 And the Metropolitan New York Auburn Club, the folks behind the biggest Auburn blitz on the Big Apple ever, print new club t-shirts with a design symbolizing the Ziemba zeitgeist of it all: Aubie as Lady Liberty. It's like they're our sister city or something. Note also the “AUBURN” spelled out in the office lights of the Empire State Building. UPDATE: The shirts can be purchased by New Yorkers and non-New Yorkers alike here. UPDATE UPDATE: Oh man, Da Chicago Club shirts are just awesome. h/t the wonderful Nicole Klein. where can we buy this?? Updated a post with a link to where you can buy them, sorry about that. Partied with some of these guys when I went to New York on business. Watched the NIT game (we lost) at Joshua Tree right off of Times Square. Good peeps. Wow, those are great — just turned it into a separate post. Thanks!